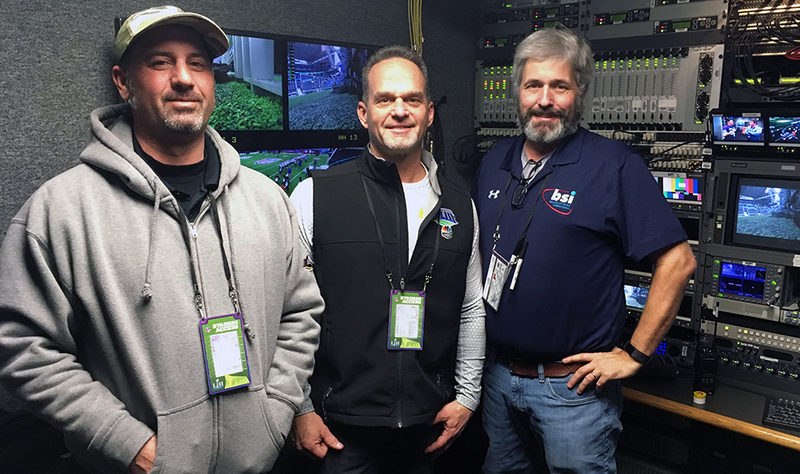 BSI is once again a major player at the Super Bowl, this year providing a cavalcade of RF cameras, microphones, comms, and coordination for NBC Sports and NFL Network in Minneapolis. In all, BSI and its 26 onsite employees are supplying nearly a dozen RF cameras, 30-plus wireless mics, and much more. For NBC, BSI is providing four stick mics, four PA mics, six IFBs, and four PLs for the Super Bowl LII game production, along with 14 wireless mics with 14 associated IFBs and four PLs for NBC’s Super Bowl Pre-Game Show. In addition, at a yurt set at Nicollet Mall, NBC is using five BSI wireless mics, five IFBs, and four PLs. On the NFL Network side, BSI has deployed two RF Steadicams for pre/postgame coverage (one is converted to a handheld for postgame), two wireless mics with IFBs, two wireless return monitors, and nine PLs. At Nicollet Mall, NFL Network has one RF handheld and one Steadicam, as well as a wireless link for the wired aerial SupraCam. NFL also has two BSI talent mics, two wireless program monitors, eight IFBs, and 10 PLs. At the Convention Center for the NFL Experience all week, BSI has deployed two Steadicams for NFL Network, along with four talent mics with associated IFBS, two wireless program monitors, and 10 PLs. On Opening Night at Xcel Energy Center on Monday, NBC had one Steadicam, three handhelds, four talent mics with IFBs, two wireless return monitors, and one PL. BSI also provided an RF camera with return video and a PL at the NFL Honors event at Northrop Memorial Auditorium on Friday night.